Handmade in France by the master craftsmen at Thiers-Issard, this is truly a wonderful, luxury Shaving Set. Containing all you need to achieve the perfect shave, the handmade shaving items in this set are fine examples of French design and engineering. 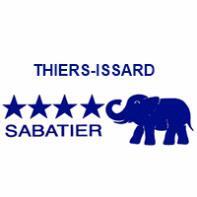 Thiers-Issard shaving items are thought by many experienced shavers to be the very best in the world, there is a cult status worldwide on various shaving blogs. Presented in a clear plastic covered box more for safe transit than anything else, this Thiers-Issard Open Razor Set is perfect for both beginners and experienced shavers. Use the brush to ensure the skin is well protected with a thick layer of shaving cream or soap. Perfect for both beginners and the more experienced shavers, this set is something special that will last a lifetime. Please take a look at our 'How To' guide before shaving with a cut throat razor, click here to read. Not the one? Click here to browse our complete collection of shaving sets.